Any trip around netflix or your local video store tells you a simple truth. There are a ton of movies out there, and most are not the sort that wind up laying at your local gianormoplex. You pass by them all the time. Wondering which ones might be worth seeing. Well we’re going to do some of the work for you. The Cinema Obscura Society, the film loving face of EVENTgelical Productions, Omaha based not-for-profit art organization, will be showing films monthly for you to take in. Some are under appreciated, some got stopped at the border, others ran out of money before release. What we can promise is they will be worth seeing either for their singular weirdness, they’re ability to entertain despite or perhaps because of their incredible lack of any redeeming quality, or that rarity of an Obscure film that was too good for mainstream release. Come on down to The Diamond on 16th. ( 720 so 16th St) have a soda or beer. (available for donation) and have a good time and let us do the work of finding the films for you. Our first show begins with some short films at 7 p.m. with our headlining film. 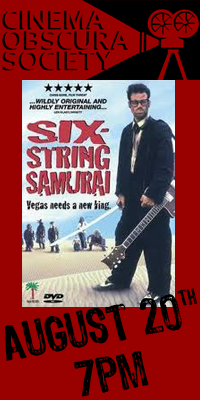 “Six String Samurai” The post apocalyptic tale of the quest for a New King of Rock and Roll to rule over the remains of Las Vegas. Welcome Back to the show!! Welcome Back to our Sponsor Quality Brands and Stella Artois!